92% of the world’s population breathes unsafe air, and an estimated 7 million die annually as a result, according to the WHO. Shocking as these statistics are, it can still be a challenge to meaningfully relate these huge numbers to our everyday lives on the planet. That’s why AirVisual has developed a groundbreaking new way to visualize the Earth’s health, in real-time. Our Earth suffers the same pollution we do. 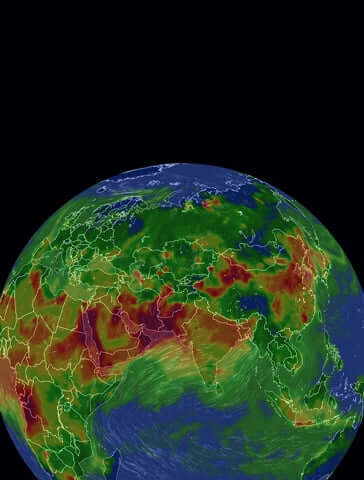 AirVisual Earth is the first map of its kind to display immediate pollution data on a 3D globe’s surface, allowing the viewer to see the shifting movements of PM2.5 pollution across countries and populations, and watch how this interacts with a hypnotic display of weather patterns. Launched to coincide with the end of the COP22 climate discussions in Marrakech, AirVisual Earth’s immediacy brings these numbers to life, and makes the urgent reality of the air pollution crisis apparent. In visualising pollution concentrations as seen from above, AirVisual Earth aims to clearly show the effect that our human emissions are having on the planet’s health, as well as our own. The interactive map allows you to spin the globe, zoom in and out, and toggle between combined PM2.5 and weather data, and just wind patterns alone. Track the different AQI levels across the planet at a glance via the globe’s colour-coded heatmapping. See what you can discover on the interactive globe - you might be surprised! Open the full-screen AirVisual Earth pollution map in your browser! As featured in the Washington Post.